Kambla very name sends shivers of excitement up my spine! The race of Man with Buffaloes in muddy water, running at breakneck speed, it was an absolutely breathtaking and exhilarating experience. This event of Kambla dates back more than 100 years ago and is usually held during the months of December and January in various parts in and around Mangalore. Village people wait anxiously for the Kambla season to start every year. I have seen Kadri Kabla long long time ago and I have faded memories of it. This time during my visit to Mangalore I was lucky to attend Arasu Kambla of Mulki. What an occasion it turned out to be. Buffaloes are handpicked and specially trained well in advance of this event. They are fed special diet, bathed and exercised on a regular basis. They also conduct mock races in makeshift conditions to resemble actual Kambla site. The actual Kambla site has dual channels of water, rectangular in shape and clear of any impediment. The channels have constant supply of flowing water. Around the center of the length of the channel they have two banners at slight different heights. The length of the rectangular channel is 110 meters and men who run along with these buffaloes are young, bare footed and at times break the speed of Olympic sprinter that is under 14 seconds. I went to the starting point of the race, where two buffalo pairs were being readied for the run. The excitement was palpable and I could hear people discussing various strategies. There were at least 8 people to each buffalo pair, trying to control them. Imagine two strong buffaloes, all excited, rearing to go but the man who runs with them is not quite ready and judges have not given the signal. Suddenly the buffaloes decide they are running regardless, to control them and to bring them back to the starting point is an event in itself to watch. Suddenly the race was on, accompanied by loud trumpet sound. It was unbelievable, and the speed at which both man and buffalo ran. It was immediate acceleration as in an Olympic 100 meters dash. There are people at the other end too to control the buffaloes. The have a wooden plank tied immediately behind buffaloes hind legs and the man at times stands on it. There is a hole in the plank through which a jet of water rockets up, depending on who touches the highest point on the banner, is adjudged the winner. The attire these men who ran with the buffalo wore was also unique, maroon lungi tied above the knee and similar colored turban (mundas) too. There must have been more than two thousand people, Various stalls were in place selling Ice-cream, hot tea and coffee, Charmuri, makeshift hotels selling idli, vada. dosa etc. The whole atmosphere was so surreal, out of this world, people of all ages including children and women gathered at one place. They were cheering at the time of the race, or just strolling around the site of the kambla. Overall it was an enthralling, action-packed, engrossing night, a must witness event if you are in and around Mangalore during the season. I too had heard about Kambala quite early in my childhood. as Idea of losing precious night-sleep, just for knowing which among those dark and not so lovable animals would run fastest, never amused me. However, strange behaviour of some of my fellow villagers while talking about Kambala started nagging me. I was baffled with the overt excitement in their voices while talking about it. Often I saw sparkle in their eyes and also a strange undertone of joy and pride in their voices. This made me believe that Kambala had some special virtue that I had failed to figure out and I felt the need to know it. Hence, when my friends organised a visit to Aikala Kambala as part of a family get together, I joined them. I am glad, I did. 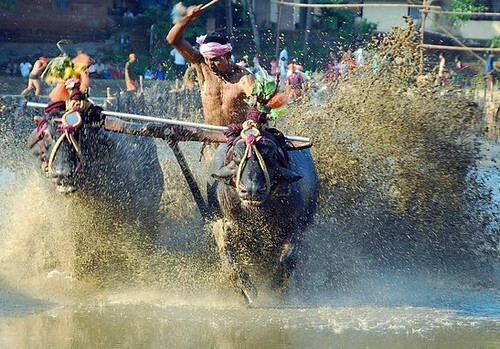 I was too keen to know the secret that made Kambala an exciting event. Hence, I rushed to the racing arena leaving my friends behind. The place was bustling with activity with air of festivity all around. People were present in hundreds. But the Buffalo presence was overwhelming. Almost every square inch of land had either a buffalo or its dung on it. I found no early clue for the secret that I was pursuing and pushed myself near to the racing fields. It was on one end of the slush filled long narrow twin racing fields, just beyond the finishing line. Once settled, I started observing every development carefully, to get the answer. I squinted towards the far end, where all the action was. There were two pairs of buffalo’s, each accompanied by a dozen of Homo sapiens. The men were struggling hard to make the beasts stand at the starting line but to their utter dismay the buffalos were not cooperating; moving abruptly every time they came close. The buffalos looked like unwilling groom of Hindi cinema, where as the assistants looked, dowry hungry parents. As this activity got stretched I opted to wander around. Men attired in traditional Mundu or Lungi were all around. Women, like the lizards of the deserts, had chosen sneaky places to sit and hide ( I wasn’t sure from whom they were hiding, men or buffalos). It was a pleasant experience to see people of all categories, age and economy group together in the same place and similar dresses as all looked part of an extended family. It looked as if everyone from the village was present there, be it the poor daily wage labourers, the octogenarians who had stopped frequenting the markets, youth, naughty kids, or a man who had left for Mumbai a decade ago. It was then that I noticed first breakthrough for the day. At the Kambala, amazingly, every one looked equal. The poor-rich divide, which was so obvious on the streets, was absent or at least heavily diminished. There was a feeling of oneness. Every one appeared a human being, just a human being. Whether, this aura of unity had something to do with the Kambala Mystery? The fields around were vast and of impressive size. Mother Nature had manifested herself in an extremely lavish manner there. A stream of water flowing as a Nala snaked across like a garland, proving to be the lifeline for the adjacent greenery. Trees surrounded the arena from all sides as if to form a green colosseum for our buffalo – gladiators. The tall barren mountains in the back yard were dark and prohibitive to look like the places reserved for the Gods and sages to sit and watch the Kambala. These lush surroundings looked apt stage for holding the age-old tradition. The comfort that was seeping into me gave second enlightenment for the day. I realised that serenity of the place coupled with the freedom that it offered from the day to day rat race, were some priceless virtues that made Kambala so special to people. Then I noticed the guy on the mike, it took me very little time to know that his role assumes as much importance as that of the buffalo. Uttering dialogues which were both amusing as well as commanding, he kept the mood upbeat with vivid and imaginative commentary and also with some timely gems which he chose to deliver at regular intervals. He was quick to spite anyone who would displease him be it a camera flashing journalists, slow moving competitor or even the disorderly spectator. I noticed that even while shouting at people he maintained the charm and regal touch in his language and dialogue delivery. You violate any rule and he’ll make you feel as worthless as a three legged buffalo in a race. He played a key role by keeping the mood elevated, all the time. Moving in the outer yard I saw the team preparations. The team associates were busy in preparatory activities like feeding, washing, nursing and pampering the buffalos. They did it all with great dedication as if they were priests for those four legged Gods. Some of them were drunk but all were thoroughly enjoying what they were doing. The Jockeys, who run the buffalo, had standout personality. With distinctly athletic features their physique commanded instant attention from every onlooker. Their naturally groomed frame looked the best prototypes for ideal and healthy human physique. I would warn the Salmans and Shahruks of the world not to visit Kambala unless they are prepared for a terrible streak of inferiority complex seeing their six packs. Please publish Results Of All Kambalas.